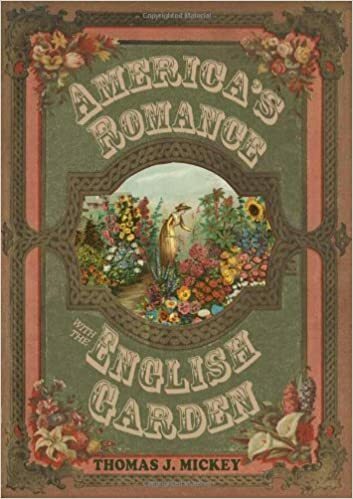 An example of the English romantic landscape in nineteenth century America has to be that of Joseph Shipley in Delaware. Shipley, a banker who returned to America in 1851 afters 20 years in England, called his home Rockwood. Philadelphia nurseryman Thomas Meehan wrote about the property in the 1861 issue of his magazine Gardener’s Monthly. Meehan said, “The magnificent place constructed and occupied by Joseph Shipley, Esq., appropriately called Rockwood, situated about two miles north of Wilmington, deserves a more extended notice than we can give it at this time. “The entire place is improved upon the plan of natural landscape – gardening so much employed in English country places, where the development of the natural resources of ground and trees, and the heightening of natural beauties by a very little art in clearing up, planting, opening vistas, etc., surpasses in real gratification the most elaborate and costly works of art. 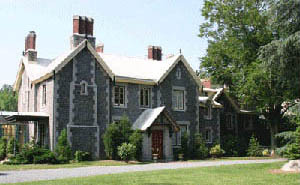 An English country style landscape surrounds the Gothic house at Rockwood, built between 1851 and 1854. Rockwood is still open as a public garden. You can also tour the house. 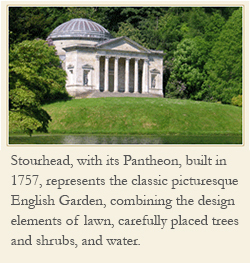 Today it still stands as an early example of the English garden style in nineteenth century American estates. And Meehan recognized its importance.